To be conscious about your looks is indeed a common concern today. Many people, particularly women, try to hide drawbacks in their faces by using makeup. A very common trouble for many people is to have a big nose. Many times, a big nose is considered unappealing. 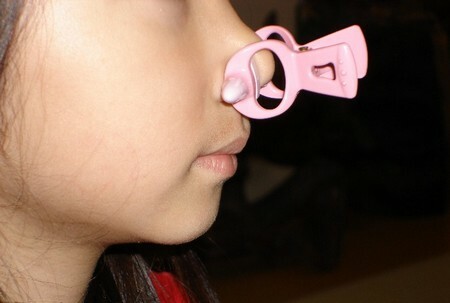 While few people can afford a plastic surgery, cheaper solution for most is to create an illusion of a nose that is smaller, though this method is temporary. An illusion of a smaller nose is created by making use of contrasting shades. Any feature that has a high contrast appears to have a well-defined outline. An illusion is thus created, for any feature can be given varying shapes according to the outline. First of all, dab your nose with the concealer stick right from the bridge of the nose to the tip. The dots should be small and placed at equal distances. Make use of a brush of medium-size to blend the dots over the center of your nose horizontally as well as vertically. The concealer should appear as a very thin, pale layer and indistinguishable from the natural skin tone. Now, make use of the brush for applying the bronzer on the nose vertically on both the sides. Apply it gently, for vertical lines may form otherwise. Only give a dark shadow, which will contrast with the subtle concealer shade. Concealer and bronzer might give your nose a shiny look that isn’t preferable. Use a big puff to dab your nose with some matte powder to remove the shine. This contrast of a lighter central part and darker sides give an illusion that makes the nose look smaller. It enhances the center, while understating the sides. It gives the nose a sharper look. Don’t over do the make-up. If the concealer or bronzer is over applied, it will be apparent that you are trying to conceal your nose. Accentuate the other features of your face as well. Put on good eye make-up to put focus on your eyes. Use a bright lipstick or highlight your cheeks with a strong blush-on. Brush it upwards to give the appearance of higher cheekbones to draw attention away from your nose. Give yourself a hairstyle that best complements your face cut. Don’t try straight bangs for these will make your nose stand out. Try side bangs instead. Ask your stylist if you need professional help.